Dr. Sophia Solomon is a leading Podiatrist in Manhattan with a focus on foot and ankle deformities and sports medicine. 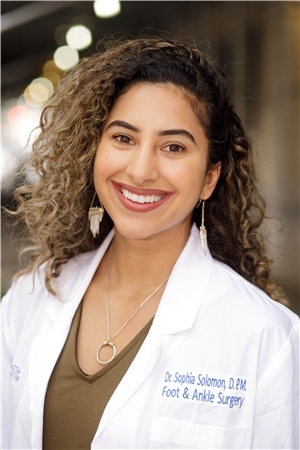 After completing her undergraduate degree at the University of West Georgia, Dr. Sophia Solomon attended the New York College of Podiatric Medicine, becoming a Doctor of Podiatric Medicine in 2015. Dr. Solomon was trained in reconstructive surgery of the foot and ankle at Wyckoff Heights Medical Center, where she served as chief resident. Dr Solomon lives in Brooklyn, New York with her family and their dog Berger.